There's a Cuban word that is pretty widely used by all 13 million (and counting) of us. However, children are not supposed to be using it. It is not a curse word, but it is one of those that is borderline. I mean, in other countries it may be a curse word, depends on who you ask. But at least the short version of the word, the one we use mostly, is totally fine everywhere. The abbreviation, or short version is: Ño. When someone does something amazing, we say ño! When someone does something awful, we say ño! As you can see, Cubans say ño for almost any occasion in life. Almost every moment is a ño moment. That previous sentence sounds like a phrase I should trademark. Anyhow, I don't say ño all the time, but my grandfather is the King of Ño. He pretty much uses that word at least a hundred times a day. He never allows an opportunity to slip by without using the word. Maybe that's whom I first heard it from, but who really knows? The picture above belongs to a store in the city of Hialeah. 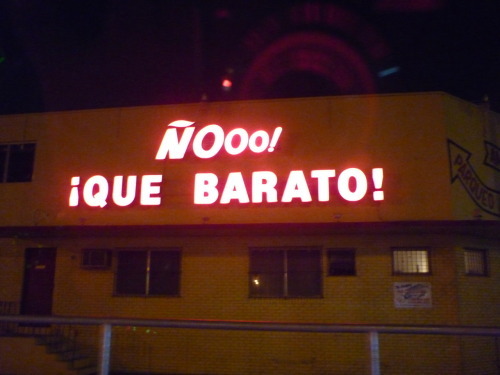 The city of Hialeah is composed of mostly Cubans, so I wasn't surprised when one morning I was driving around the area and saw the Ñooo Que Barato store. "Que Barato" means, "how cheap." I've never been inside the store, something that I regret now, but I know that you can find almost anything in there. Think of it like a Cuban dollar store, where everything is so cheap, and hopefully so good, that when you leave, there's only one thing you can say, Ñooooo! Now, when you finish reading this post, and you plan on telling your friends, I hope you end up telling them, "Ño what a great story!" Posted in cuban american, funniest blog ever, israel sanchez, ño, not in cuba anymore . Bookmark the permalink. RSS feed for this post. haha! very nice, love. your grandpa and his infamous "ño's"... classic! i need to start writing my miami book. Lol, you sure do my love. That book will be awesome!